In recent years, the issue of repatriation has garnered attention as institutions like the Metropolitan Museum of Art and the Getty Museum have returned artifacts to their source countries. Where does the issue stand today, and what impact does this have on your collectors? Provenance has always been important, and in light of recent repatriation issues, it has become paramount. In a way these issues have helped the auction business because of the transparency of our operations; buyers can have complete confidence when buying at auction. Everything we do is published, and source countries have the opportunity to review our catalogues long before the date of sale. Remember that this interview was issued subsequent to the report by Theo Toebosch on May 15. I have long-argued that provenance is a misused term. Christopher Chippindale and I would argue for the term "collecting history". However, provenance is a term much used by those engaged in the antiquities market. Last June Bernheimer was quoted in a Christie's press release: “Today’s [sc. June 3, 2009] strong results show that wonderful objects with clear provenance continue to perform exceedingly well at auction.” In the accompanying list of the "Top Ten" pieces in the June 2009 auction was lot 120, "An Attic red-figured Pelike, attributed to the Aegisthus painter, circa 480-460 B.C. ", that sold for $80,500. Yet subsequent to the sale lot 120 was apparently seized by ICE agents. A second lot, an Apulian situla was seized at the same time; a Corinthian krater had been seized immediately before the sale. How are we to understand Bernheimer's definition of "clear provenance"? 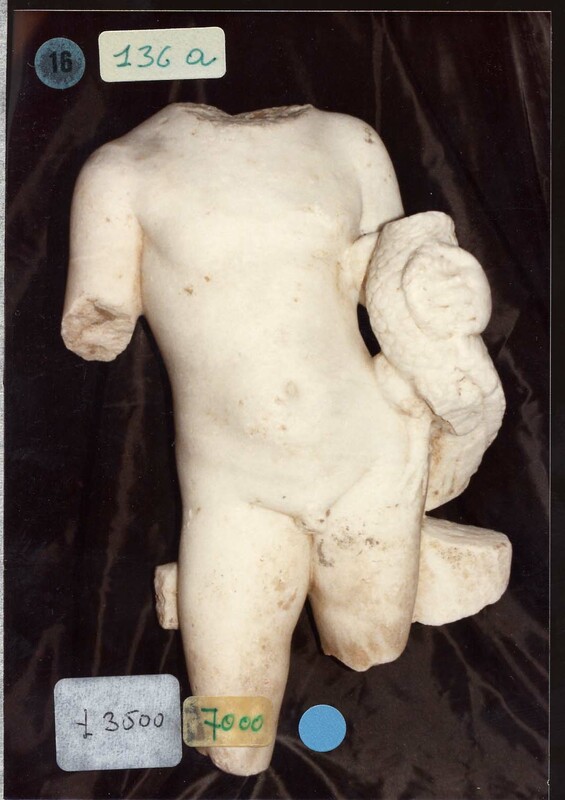 It would be interesting to know the reaction of the buyers of the two pieces (the Apulian situla and the Attic pelike) when they were seized. The events of 2009 rather undermine Bernheimer's statement: "buyers can have complete confidence when buying at auction". Bernheimer emphasises "the transparency of our [sc. Christie's] operations". He adds "source countries have the opportunity to review our catalogues long before the date of sale". The characteristic of transparency was stated by a spokesperson from Christie's in the wake of the seizure of the two pieces. Indeed the Corinthian krater was seized from Christie's just before the June 2009 sale. It appears that the krater matched an image found in the Medici Dossier. And in December 2008 a piece of gold jewellery was withdrawn by Christie's after claims had been made by Iraq. John Morton of ICE made the specific point when the jewellery was returned: "These are precisely the types of treasures that ICE's Cultural Property Art and Antiquities unit was established to identify, investigate and return to their rightful owners. We will continue to be vigilant about finding and prosecuting those who would rob a nation for personal gain.". The December 2008 sale was also reported to have contained Egyptian antiquities that appear to have been removed from the Long Island University's Art Museum. And a portrait of Marcus Aurelius that was offered by Christie's in June 2004 appeared to have been stolen from Algeria. Looking further back there was the head of Asklepios from Butrint that had apparently passed through Christie's London in 1996. Antiquities from the Bijbels Museum in Amsterdam were seized from an unspecified New York auction-house in 2009; Sotheby's made it clear that they were not involved while Christie's "were unable to confirm this". Let me return to transparency. The Christie's catalogue for June 2010 has prompted the possible identification of three pieces with objects illustrated in the Medici Dossier. If provenance is "paramount", as Bernheimer has claimed only this week, please could Christie's state the collecting histories for the three lots? Bernheimer wants "buyers" at Christie's to "have complete confidence when buying at auction". Doubts will remains if he fails to provide "clear provenance" for these three pieces. One has to wonder if the police are able legally to compel the auction houses to disclose to them al they know about the seller and putative chain of ownership, and if so, whether the surfacing of this material at auction might present an opportunity for law enforcement to walk the dog back and uncover a smuggling network or two.